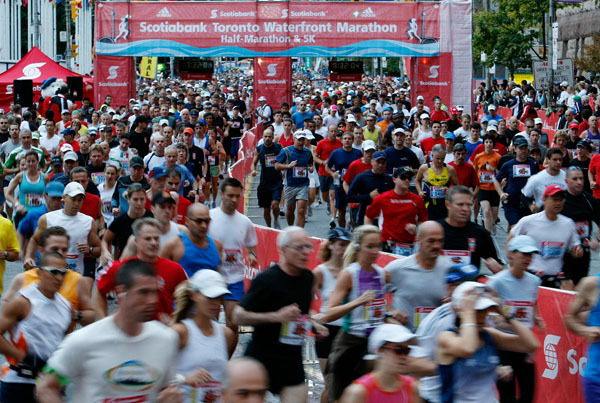 Many months ago I signed up to run the Scotiabank half marathon in Toronto. I had the best intentions to train properly, but as the day neared, I had only ran once in the last month! Mental strength and proper nutrition saved me. The first 10 K were the easiest. I crossed this point after an hour and two minutes, and I felt great. At the 12 K flags I saw my friend in the crowd, which gave me a pick-me-up for a few kms. Sometimes I listened to music, while other times I listened to Yuri‘s coaching tracks. It was nice to have him with me, encouraging me the whole way. Whenever I needed some motivation, I tuned into him. Most of the time I was present. I was enjoying the run, and the pace. I spent most of the race just being happy. When I reached 16 K, my mental battles began. Just a little break, I thought, just for a minute. But I delayed the walking, and continued to run. Over and over, I kept thinking “you can quit anytime, so why not quit at the end.” I remembered the saying from one of Yuri’s recordings, and it really helped me through. The last 500m were the absolute worst. I had nearly convinced myself to quit when I remembered I had 20 K under my belt without walking, so I pushed on, saying over and over: “you can quit at the end. You’ve made it so far. Keep going!” I think the biggest problem here was that we started and ended in the same place, so I knew exactly how far I had to run. Although 500m isn’t far, when it’s at the end of a half marathon, it’s like China far! Finally I crossed the finish line. My legs were done, and I was smiling. I collected my medal and joined my friends once again. My time was 2:11:28.5 – not bad for not training. We ran at the same time as the full marathoners, so there were people were ending at the same time as me, only they had run twice as far! Some people just collapsed into the paramedic tent, completely exhausted, and their bodies frail. I can’t imagine how they must have felt, considering I ran the half and couldn’t even walk. It’s like someone took a bat to my entire body, giving special attention to my knees and ankles! Would I do it again? Maybe. Now that I have a base time, it would be nice to see where training could get me. It would be fun to see how well I could do fueled by wheatgrass and green juices! Would I ever run a full marathon? Never. Just seeing the marathoners looking close to death is enough to tell me that it’s really not necessary to put your body through that much stress. It’s quite ridiculous actually! But then I remember the saying “if it hurts, don’t do it again.” So this very well may be my last half marathon! You are insane! Well done! Congrats on running the half marathon. I would hardly be able to run half an hour. Keep it up!